Duluth has the amazing Duluth Traverse trail that ties together several mountain bike trails. Even that trail has some road connectors though. 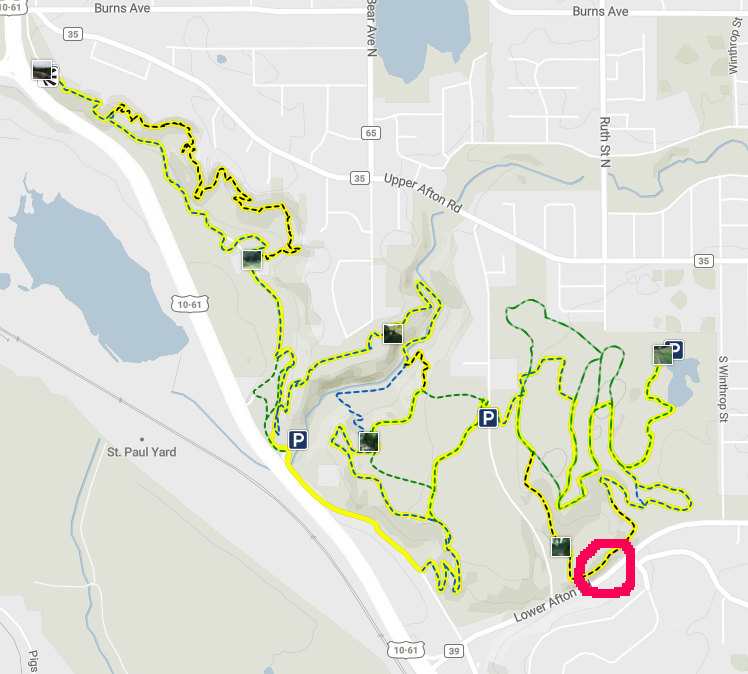 It occurred to me that there’s a natural St Paul “Traverse” trail that connects anything along the river with Battle Creek and Carver. It’s most paved bike trails or single track with a bit of quiet road. Here’s the overview and the Carver MTB component. The area circled in red is where I’d prefer to jump out of BC onto the paved trail. This is at the base of Goat Trail (not a beginner trail! ), from the satellite map close up it looks like one could descend a grassy area to the paved trails. The map below is from mtbproject (REI). This would be a solid day of road/single track riding for most of us!